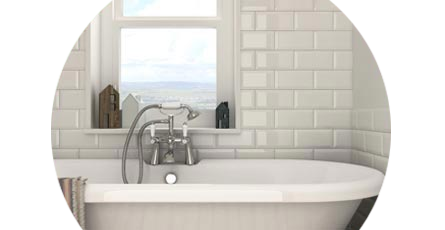 We stock every style of tile you'll need to give your bathroom a look which is right on trend. Choose from a selection of modern tiles, traditional and art deco bathroom tiles to coordinate with your other furniture and fittings for a designer finish. You can even order tile samples to make sure your tile choice is the right choice. With a huge choice of tiles from designer brands and in-house options you'll find bathroom tiles for any budget. Use the filter options to quickly find the perfect tile material, finish, colour and shape. If you'd like to speak with our tile experts then please feel free to call us for advice. "Going into a kitchen as a splashback. Lovely colour, although lighter than shown in the picture, which is fine for us. Very well made and solid. Would use again if I had to." Extremely pleased with these tiles in our new kitchen. They fit together so well that the walls do not look tiled at all. The off white adhesive was also the perfect colour to squeeze into what little gap there was and blended with the colour of the tiles so much that some joints are virtually invisible. Very convincing and look really warm and rich on wall. "I needed to match these tiles to ones already on wall, they were perfect in every way, no problems with sizes and thickness."